The Honda Civic has been the best-selling car in Canada for more than 20 years and this success does not seem to want to be going away anytime soon. With the new Honda Civic, the buyer gets an even more fuel-efficient, safer and more comfortable vehicle. In short, the Civic is well-anchored at the top of the sales charts, especially that it also offers a host of versions including the new 2018 Honda Civic Hatchback. The latter is the most spacious and versatile version of the Civic range. With it, you can carry just about anything while having fun behind the wheel! 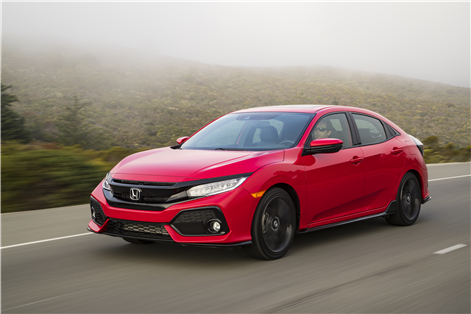 For starters, note that unlike other 2018 Honda Civic models, the hatchback is only available with the powerful 1.5-liter turbo four-cylinder engine producing 174 horsepower and 167 lb-ft of torque. We would think that this engine is more or less fuel efficient because of its power, but it's quite the opposite. Indeed, the turbo in question displays an average fuel consumption rating of only 7.7 liters per 100 kilometers in the city and 6.0 liters per 100 kilometers on the highway for an average of 6.9 liters per 100 kilometers when one opts for the continuously variable automatic transmission. Even with the manual, fuel consumption remains very reasonable with an average of 7.2 liters per 100 kilometers. There is also a sportier version of this engine that develops 180 horsepower and 177 lb-ft of torque. Available in the Sport versions of the Civic Hatchback range, this engine is equally economical with an average fuel consumption of 7.2 liters per 100 kilometers! But what impresses the most with the new 2018 Honda Civic Hatchback is the cargo space. Indeed, the Civic Hatchback offers more than 700 liters of space behind the rear seats and more than 1,300 liters if you lower the rear seat. What else could we possibly want from our Civic ? Contact us today at Halton Honda to learn more about the new 2018 Honda Civic Hatchback!